We enter the winding down phase of the G1 tournament as the next two nights will see the winners of each block emerge, then fight for the trophy on the third and final night of the tournament on August 14th. All three shows, including tonight, are at Sumo Hall in Tokyo, Japan. The Briscoes defeated Captain New Japan & Yoshitatsu when Mark pinned CNJ with the Froggy Bow. Yuji Nagata, Manabu Nakanishi, Jushin Liger, & Tiger Mask defeated Tomoaki Honma, Ryusuke Taguchi, Juice Robinson, & David Finlay when Liger pinned Finlay with a cradle. Katsuyori Shibata, Michael Elgin, Satoshi Kojima, & KUSHIDA defeated Toru Yano, YOSHI-HASHI, Katsuhiko Nakajima, & Atsushi Kotoge when Kojima pinned Kotoge with the lariat. Kenny Omega, Tanga Roa, Yujiro Takahashi, & Hangman Page defeated Tetsuya Naito, EVIL, BUSHI, & Jay Lethal when Page pinned BUSHI with the Omori driver. Really good match. The crowd was hot for all the near falls as they liked the Tenzan story. Fairly standard back and forth to start. Tenzan started to gain some momentum with the TTD but missed the moonsault. The announcers were putting over that this may be the final time Tenzan will ever compete in a G1 match. Tenzan channeled Kojima and hit his lariat but SANADA kicked out. Tenzan followed with the Anaconda Vise, then followed with the Anaconda Buster but SANADA still kicked out. SANADA blocked another TTD attempt and sunk in the Skull End but Tenzan made it to the ropes. SANADA hit his own moonsault but Tenzan kicked out, only for SANADA to follow up with the Skull End again. Tenzan struggled, but eventually submitted in what could be his final G1 match ever. Good match. They feuded way too much last year so this came off like a retread to me, but they always have explosive matches and this was no different. They’ve had better, but this was still good. All action as they hit hard and heavy for a lot of the match. Some big time, hard hitting shots. Makabe hit the Spider German but Ishii rolled out of the way of the knee drop. Ishii made a big comeback and got the win with the brainbuster. Okay match but the logic was totally lacking. They did the ‘ol laying down bit with Tonga willing to do the job. They do this on occasion, usually when stablemates face one another, but these stakes are different since a Fale win here could make him the winner of the block. So Fale covers and tells the ref to count. Red Shoes is reluctant, but eventually does, only for Tonga to kick out and sneak in a roll-up for a two count. Fale tries again, but Tonga kicks out again. Why would it matter if Tonga wins here since that just makes them both losers in the overall scheme of things? So they have their match. Fale works on him a while after giving him a Bad Luck Fall to the outside, with the other Bullet Club members catching him. Tonga plays babyface and makes a comeback. Tonga tries the Gun Stun a few times but Fale is able to block it. Tonga eventually got it, eliminating Fale from the tournament. So Fale, who was just eliminated from the tournament because Tonga screwed him over by backing out of the deal they made, was completely cool with this after the match and they did the too sweet sign. How forgiving of him. Good match, the last few minutes were pretty great. Solid start as both brawled outside the ring and exchanged some solid back and forth. Marufuji wiped out Goto with a nice looking tope. Marufuji tried the Sliced Bread but Goto kept blocking it and made a comeback. Goto hit the knee neckbreaker and went for the GTR but Marufuji countered with some great looking kicks. Marufuji was just climbing to the middle rope for the Sliced Bread when Goto put him in the rear naked choke. Marufuji rolled along the floor to try and escape, but he couldn’t do it and Goto finished him with the GTR. At this point, Goto can win if there is a draw in the main event. Otherwise, whoever wins this next match goes to the finals. This is an interesting match to judge because a lot of it was built on the drama of there potentially being a draw. 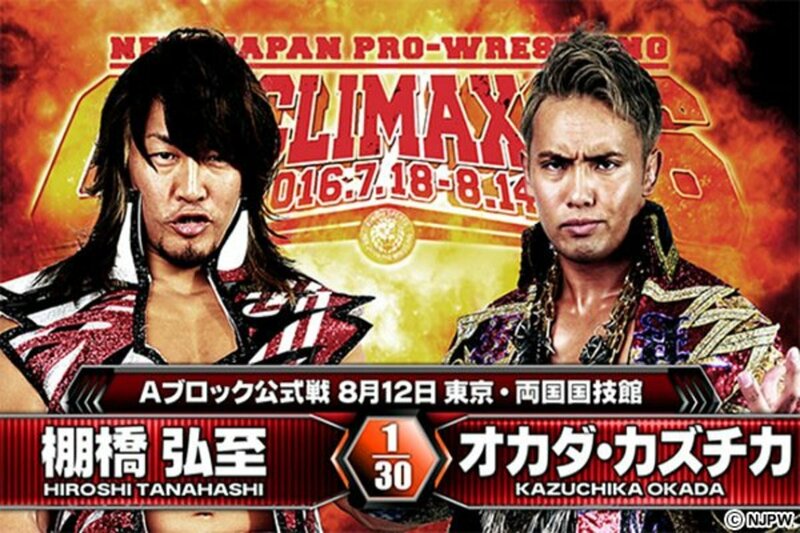 Watching this live, it was a completely awesome match, I don't think on par with the match from WrestleKingdom this year but it's a stellar match among their many matches over the years. How it will be judged now that everyone knows the result, well, I don’t know, but this was absolutely a fantastic match live, about neck and neck with the Okada vs. Ishii match from last week. They had their usual back and forth but things picked up quickly as Okada went for the elbow and tried the Rainmaker but Tanahashi countered with a cradle. Turned into a more deliberate match with Okada taking it slow and working over Tanahashi, while Tanahashi worked on Okada's legs a few times. Okada did the big dropkick that sent Tanahashi tumbling shoulder first down to the floor. Tanahashi hit back with a High Fly Flow to the floor but Okada fired back with a tombstone. Tanahashi pushed Okada to the floor as they were battling on the top rope, but missed the High Fly Flow attempt after. Tanahashi comes back and works on the leg, giving two dragon screws then applying the cloverleaf. Okada fought valiantly and made it to the ropes. Tanahashi hit a reverse sling blade then hit a High Fly Flow, and went for another but Okada got the knees up. Okada tried the tombstone but Tanahashi reversed it and nailed him. He went for the High Fly Flow but Okada nailed him with the dropkick. Tanahashi hit him back and hit two High Fly Flows. Okada kicked out at three and that right there was when the bell rang, ending the match as a draw. Since neither get the two points needed to advance, and with Hirooki Goto at 12 points, Goto is the winner of the A Block. Tomorrow’s show will determine the B Block winner.